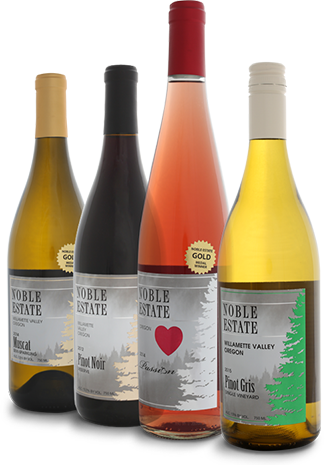 Noble Estate produces nearly 20 types of award-winning red, white, and sweet wines. The South Willamette Valley is blessed with a climate similar to that in France and the volcanic soils of Oregon contribute a delicacy that enhances our wine flavors. Our customizable wine club offers members the opportunity to enjoy a variety of wines throughout the year. Other benefits include complimentary tastings at all three Noble Estate locations, discounts, and more. Get new wine releases, specials, and upcoming events straight to your inbox. Noble Estate is a family-owned vineyard and winery in the South Willamette Valley. The vineyard is certified by LIVE and Salmon-Safe for sustainable practices and all wines are hand-crafted by a dedicated team of winemakers. Our award-winning wines are available at our tasting rooms and online store or through the wine club. Our three tasting rooms include the Vineyard and Urban locations in Eugene as well as the Newport location at the Oregon Coast. Learn more about our story and see the gallery to get a taste of all that Noble Estate has to offer.